Being bold and adventurous, seeking a career linked to their hobbies and being entrepreneurial are amongst the key interests of Generation Z (Gen Z) in Malaysia according to a landmark survey to understand this group better. The generation – which defines those born between 1995-2009, is also known as the ‘hyper-connected’ generation as most spend an average of eight hours a day on the Internet, with some 41% feeling incomplete when not connected. The findings revealed that some 42% want to do something completely new when making career choices, 37% hope to turn their hobbies into a profession and 31% want to be entrepreneurs. They regard a successful person as someone who earns a high salary (75%), is happy with themselves (69%), is healthy (69%) and able to enjoy his or her career (60%). 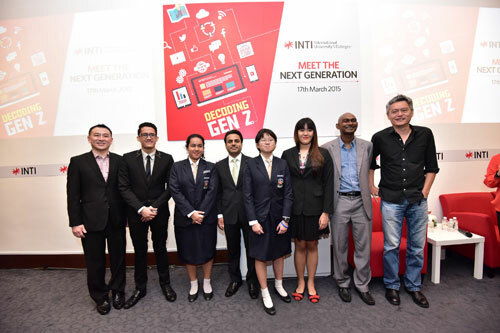 Interestingly, Parents (38%), Athletes (19%) and Political Leaders (12%) are cited as role models by those surveyed.Covering both qualitative and quantitative research, the study commissioned by INTI International University and Colleges was conducted via focus group discussions and in-home interviews with more than 500 Gen Z respondents from key market centres throughout Malaysia. While it is a known fact that social networking sites are high on the list when surfing, what the survey revealed is that close to 94% visit sites such as Facebook and Twitter, while 56% browse for information and 55% access the Internet for instant messaging / chatting. The top 5 platforms used by Gen Z are Facebook (92%), WeChat (70%), YouTube (66%), WhatsApp (66%) and Google+ (33%). Citing a “fear of being offline”, more than half of Gen Z stated that they love their gadgets, are actively or passively connected to the virtual world perpetually, with more than 80% looking at between one to three screens on a daily basis – be it on the smartphone, laptop, desktop or TV – with the smartphone being the main device. The survey also revealed that approximately 49% of them prefer short and crisp messages while 34% prefer to use short forms in conversations. “In the past there was a clear divide between the virtual and real world. The Gen Z study reveals that those lines are blurring, which then presents new opportunities for key stakeholders including parents, educators, businesses and policy makers to engage with this generation,” Sharma added.With unlimited resources accessed through digital platforms, Gen Z feels an elevated sense of responsibility to the world and society with 28% of them wanting to do voluntary work and participate in work that contributes to the well-being of society. This is a generation that believes that it has a duty to help others and is very global in its outlook. The survey indicated that the biggest worries of Gen Z include finding a good job (56%), being accepted into a reputable higher education institution (44%) and their family’s financial situation (42%). With such findings, it is clear that Gen Z is well-informed and takes into consideration many external factors when deciding the next step in life. They are clearly aware (50%) that education is an essential tool to help them improve their lives and those around them. Whilst Gen Z is living a virtual life, close to 60% of them are nevertheless worried about fake profiles on SNS and 54% are worried about disclosing their personal information. “With such findings from the survey, a high dependency on virtual networks certainly highlights a phenomenon that we must all embrace, and not be complacent with risks that are prevalent. We must work together to positively leverage on the various digital platforms to ensure today’s youth successfully become the leaders of tomorrow,” Sharma commented. Two panel discussions, with the first composed of key industry leaders were organised in conjunction with the launch of the survey findings. The panellists included Mr. Rohit Sharma; Mr. Sajith Sivanandan, Managing Director of Google Malaysia; Mr. Roshan Thiran, Managing Director of Leaderonomics; and Mr. Patrick Ng, Partner, PwC Malaysia. The moderator was Freda Liu, BFM Producer and Presenter. 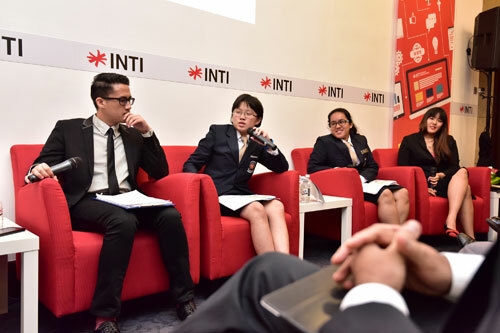 The second panel discussion was composed of Generation Z students Ahmad Mustaqim bin Nordin (19 years old), Ruby Wong Chui Yee (19 years old), Jacinta Jea Ling (17 years old) and Moh Shu Jenn (17 years old). The moderator was Pete Teo, Malaysian musician, filmmaker and motivational speaker.“As an institution of higher learning, we have the responsibility of transforming lives by helping shape teenagers into confident young adults by working closely with key stakeholders including parents, the industry as well as the government. We believe that by understanding the attitudes and views of Gen Z, we can assume our respective roles better in helping to shape the future of the country,” Sharma concluded.